Question #1: Could you give the race fans a brief history of your racing career? Question #2: Why OSCAAR in 2014? Ethan: Well when I purchased the car at the end of the 2012 season, I planned on doing a few races in 2013 to get my feet wet in the super late model. It was always my intention to commit full time in 2014, and I have the car and team ready to tackle the series full time. I have been around the series and super late models and seen all the tracks so I think I am ready to make the jump. Question #3: What is anything are you the most nervous about making the switch the super late model? Ethan: I won’t sit here and say I wasn’t nervous last year making my first start, and like every other racer I still get butterflies before each race. But once the green flag waves you are just concentrating on doing your best out on the track. I also know OSCAAR is the biggest thing in racing here in Ontario, and if you mess up here it is a big deal. You are racing the best short track drivers around, everyone has a lot of money invested and you would hate to cause issues for anyone. Question #4: At the end of the 2014 racing season when you look back what would make it a successful season in your eyes? Ethan: At the end of the season if I can look back and say to myself I did the best that I could each week, get the respect from my fellow drivers, maybe a heat race win or two or even the Rookie of The Year title I would say I had a pretty good 2014 season. Perhaps finishing ahead of the #13 or #551 would feel pretty good as well. Question #5: In 5 years from now where do you see yourself as part of the racing scene here in Southern Ontario? Ethan: Well I am very lucky I think I have already reached the top of the racing world with OSCAAR. I am hoping that in 5 years I am still able to be a part of the series, have a few feature wins under my belt, and be a contender each and every week. I think it is very safe to say I will still be racing and having fun at it. I would like to thank Ethan for taking the time to sit down and talk and like to wish him and his entire team the best of luck in the 2014 season. The latest driver to throw his hat in the ring for the 2014 OSCAAR Rookie of the Year title is Scott Field. In the past month a lot has transpired to make this happen. Scott recently bought the former #63 Jim Bowman super late model team. 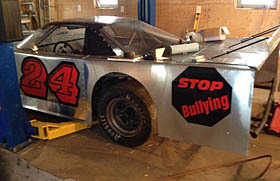 The car has a complete new outlaw body on it, the #24 painted on the side and the team is ready to hit the track for the season opener in May at Sunset Speedway. The addition of Scott will bring the total number of rookies to five in 2014, which will be the biggest field of rookies in series history. Fans will be definitely be watching the race with in a race to see who will be the 2014 Rookie of the Year. Scott: Well like most people I am carrying on the tradition of racing that started with my father back in 1963. My driving career began in 1989 in the street stock division. It was in 1994 that I got my first championship in that class. I continued racing in the challenger division for the next 8 years then I took a little break. Well like most racers you never really quit and in 2012 my father in law and myself bought a thunder car together and we were racing again. Scott: Well to be honest it has all happened so fast I really haven’t had time to process it all. I saw the #63 for sale on the internet, I went with my son to check it out and first thing you know here it is in my shop. I guess my logic was if I am going to race why not drive a car that will get you around the track the quickest. Scott: Well like any new driver to any new series, you don’t want to do anything out on the track that will cause problems. I know I will be competing with some of the best drivers in Ontario, and I want to make sure I earn their respect. I am also very comfortable in the car that is my sanctuary so my worst fear is falling asleep in the lineup shoot. If that does happen we can blame it on my kids, having 5 girls and 1 boy that keeps me pretty busy. Scott: It is very hard for me to say if I will be racing in 5 years. If I am I am sure it will be in OSCAAR and the super late model. If I have chosen to hang the helmet up by then, well then I will be there to support anyone of my 6 children that would like to carry on the family tradition of racing. I would like to thank Scott for taking the time to sit down with me to do this interview. I would also like to welcome him and his entire team to OSCAAR and wish them all the best in 2014. Scott Field will be an OSCAAR rookie in 2014.